Figure 18.11. Different types of transmembrane proteins (classified according to G. von Heijne, Biochim. Biophys. Acta 947, 307-333, 1988). A: Proteins with uncleavable signal peptide (USP, type II). The positively charged N-terminus remains on the cytoplasmic side of the membrane (see Fig. 18.10, A), the signal peptide is anchored in the membrane, and the rest of the protein falls through the membrane into the lumen. B: Proteins with cleavable signal peptide, but containing uncleavable nonpolar "stop-transport" (anchor) sequence closer to the C-terminus (ST, type I). After formation of the loop (Fig. 18.10, A), the signal peptide is split off, and the polypeptide chain grows into the lumen until the "stop-transport" sequence is anchored in the membrane; the C-terminus remains on the cytoplasmic side and usually is positively charged. C: Proteins with non-polar "start-stop" sequence near the N-terminus (SST, type III). The negatively charged N-terminus is translocated to the lumen side of the membrane (Fig. 18.10, B) and followed by a non-polar sequence that becomes anchored in the membrane. As a result, further translocation of the growing polypeptide through the channel is stopped, and thus the rest of the protein (a bulky C-terminal part) remains on the cytoplasmic side. (Grp170) has recently been found in mammalian microsomes. This protein has been shown to stimulate insertion of nascent polypeptide chains into the translocation apparatus of the endoplasmic reticulum membrane in a nucleoside triphosphate-dependent manner. The nascent polypeptide chains penetrating into the endoplasmic reticulum lumen undergo various cotranslational modifications (see below, Section 18.6). The cleavage of the signal sequence occurs when the nascent chain becomes ca. 150 residues in length. The chain continues to grow through the channel remaining in contact with the Sec61p protein until termination of elongation. The proteins destined for secretion are folded in the lumen of the endoplasmic reticulum, this process being governed by special molecular chaperones (GRP78 and GRP94), and then enters the exocytic flow. Polypeptide chains bearing uncleavable signal peptide remain ultimately bound to the endoplasmic reticulum membrane with the amino and carboxyl termini facing the cytoplasm and the lumen, respectively (Fig. 18.11 A). Such polypeptide chains span once the lipid bilayer (type II membrane proteins). In this case both the hydrophobic signal peptide and the subsequently formed hydrophilic parts of the nascent chain occupy the same channel (presumably being two ends of a loop, like in Fig. 18.10 A) until termination of elongation occurs, i.e., for the relatively long interval. Such a situation suggests an inducible amphiphilic character of the channel. After termination the hydrophilic part of the newly synthesized protein is released into the lumen. Another type (type I) of membrane-bound proteins, exposing the carboxyl and amino termini to the cytoplasm and the lumen, respectively, and spanning the lipid bilayer once, is formed when the polypeptide chain contains, in addition to the cleavable signal sequence, a specific region (uncleavable stop-transport signal) of ca. 20 non-polar amino acid residues located closely to the carboxyl terminus and usually flanked by a cluster of basic residues at its cytoplasmic end (Fig. 18.11 B). The change of the hydrophilic content of the channel for a hydrophobic one, taking place during translocation of the growing chain, implies again potential amphiphilic properties of the channel. There is evidence that the nascent chain leaves the channel to be embedded into the lipid bilayer only after termination of elongation, and from this moment its stop-transport region no longer contacts the Sec61p and TRAM proteins. One more type of targeting signals is the so-called "start-anchor" or "start-stop" sequence that bears negative charge at its N-terminal part (Fig. 18.11 C). Polypeptide chains with such a signal are membrane-bound and characterized by a bulky C-terminal part facing the cytoplasm. The arrangement of polytopic polypeptide chains spanning the membrane several times is achieved owing to the presence of repeating insertion sequence in addition to the signal sequence (cleavable, uncleavable or start-anchor). As the experiments with recombinant proteins have shown, the function of the insertion signal can be performed by an amino acid sequence of ca. 20 non-polar amino acids. The efficiency of such a signal is augmented by positively charged residues flanking it at the carboxy-terminal side. Thus, one can see that the insertion signal is similar, if not identical, to the stop-transport signal (see above). It has been shown that as each transmembrane segment in a polytopic membrane protein emerges from the ribosome, it sequentially translocates across the membrane. Reinsertion of a growing polypeptide chain into the membrane depends on the distance between the preceding transmembrane region and the newly formed insertion signal; hydrophilic amino acid sequences longer than 100 residues hinder this process. There are grounds to assume that a growing polypeptide chain does not leave the translocation channel, or the translocation channel preserves its integrity in the membrane, until termination of elongation occurs. Particularly, it has been found that the hydrophilic environment of the chain in the channel is not altered for a hydrophobic one until the chain remains bound to the ribosome. Termination of translation and release of the nascent polypeptide from the ribosome seems to allow a rearrangement of the membrane environment of the transmembrane polypeptide in such a way that its hydrophobic segments are trapped by lipid bilayer of the membrane, and the folding of the transmembrane protein completes (see Borel & Simon, 1996). Although the nascent-chain-bearing ribosome is generally docked at the endoplasmic reticulum membrane in such a way that the translocation channel is isolated from the cytoplasmic environment as long as the translocation proceeds, there are some exceptions to this rule. For instance, cotranslational translocation of apolipoprotein B (apoB) was shown to be discontinuous, i.e., the apoB polypeptide chain is exposed transiently to the cytoplasm during its elongation (Hedge & Lingappa, 1996). Translocation pauses occur when a specific amino acid sequence (pause transfer sequence) in apoB meets a membrane component and binds transiently with it. At this moment the tight ribosome-membrane junction opens, and the growing chain renders sensitive to exogenous proteases and antibodies. 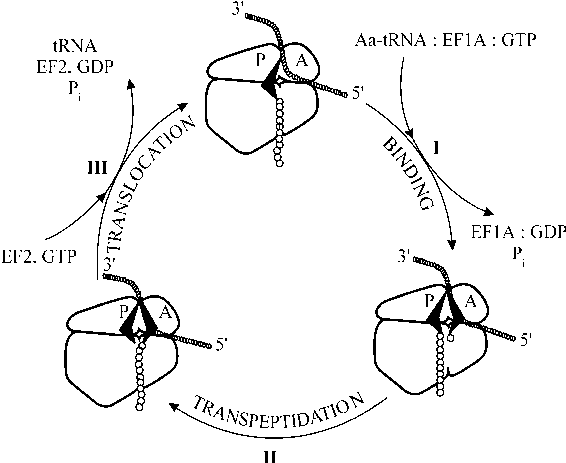 The exposition of the nascent chain is followed by its reentrance into the translocation channel and by the restoration of the ribosome-membrane junction (Fig. 18.12). A part of the nascent chain temporarily protruding into the cytoplasm may be of 50-60 residues long. Figure 18.12. Sequence-specific pausing in the co-translational transmembrane translocation of the growing polypeptide chain. (See R. S. Hedge & V. R. Lingappa, Cell 85, 217-228, 1996). (1) During elongation of the nascent polypeptide a specific sequence, called "pause transfer sequence" (PT, boxed), enters into the translocation channel and becomes temporarily anchored there. (2) The continuing elongation results in exposing the following section of the growing polypeptide to the cytosol. (3) As the polypeptide chain continues to grow further, the "pause transfer sequence" is forced through the channel and the transmembrane translocation becomes restored. pathway. N-Glycosylation, at least in some cases, may be crucial for proper protein folding, as well as for protein stabilization. Regarding the proteolytic processing and the N-glycosylation, cotranslational character of these processes is a consequence of location of the enzymes responsible for them, i.e., signal peptidase and glycosyl transferase complex, in the vicinity of the translocation channel. In contrast to proteolytic processing and glycosylation, formation of intramolecular disulfide bonds occurs owing to the action of protein disulfide isomerase, a soluble resident protein of the endoplasmic reticulum. Different types of nascent chain modification are interdependent and intimately connected with polypeptide folding which in turn is mediated by both membrane-bound and soluble chaperones of the endoplasmic reticulum. This point can be exemplified by the data for influenza virus hemagglutinin (Chen etal., 1995). The protein has the N-terminal cleavable signal sequence and the transmembrane region (residues 514 to 540) close to its C-terminus. The body of the protein faces the lumen with seven N-linked oligosaccharides and six interchain disulfide bridges contributing to its structure. It has been documented that glycosylation of Asn165 and Asn286 as well as formation of disulfide 52-277 bond proceed before the completion of polypeptide chain elongation. Interestingly, inhibition of glycosylation with tunicamycin prevents proper folding of hemagglutinin and causes its aggregation due to formation of aberrant intermolecular disulfide bridges. of the nascent hemagglutinin polypeptide chain its different parts are concurrently engaged in several processes - glycosylation, glycan trimming, disulfide bridge formation, and interaction with both membrane and soluble chaperones in the endoplasmic reticulum.